Wobbly Whiskey Glasses feature a convex bottom which keeps them tilted when at rest. The design demands you fidget with them, but no matter whether you're pouring two fingers, three fingers, or a whole fistful, Wobbly Whiskey Glasses won't spill. 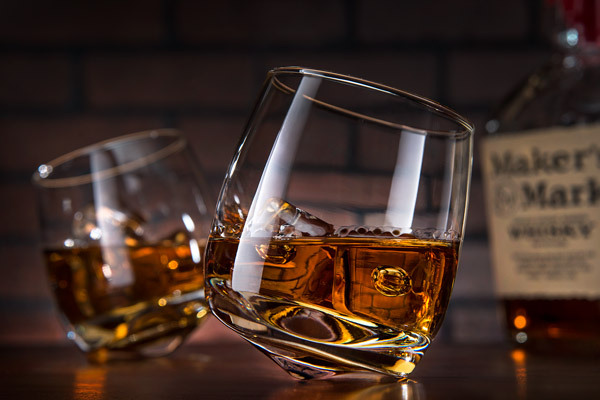 Fun to spin, tap, and even slide across a table, Wobbling Whiskey Glasses are high-quality barware that any connoisseur will enjoy. Six glasses per set. Let me tell you a story about the "Bulbous Tunc"
The bulbous "cone" of glass at the bottom of the Wobbly Whiskey Glass is known as a tunc. In traditional (non-wobbly) glassware, it's purpose is to prevent the glass from tipping over. In the case of the Wobbly Whiskey Glass, it's what gives these glasses their distinctive style. We also think "Bulbous Tunc" sounds like a character from Star Wars. So, that's cool. 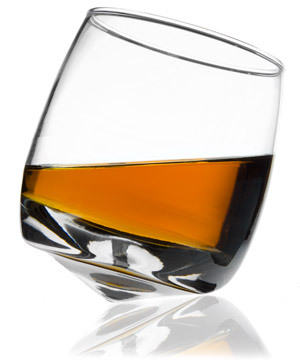 The convex bottom gives the Wobbly Whisky Glass its distinctive "gangsta lean". Fun to fidget with, won't spill! 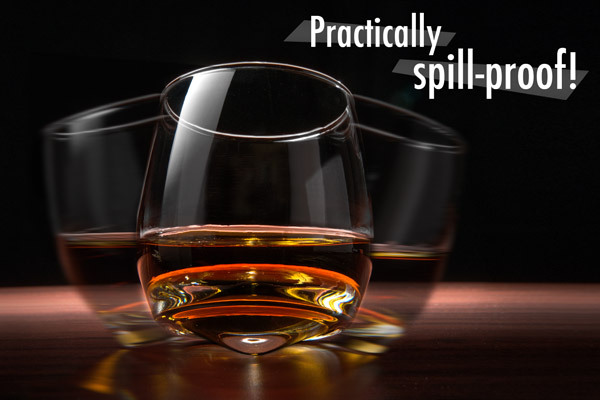 The Wobbling Whiskey Glass simply begs to be played with. Give it a light tap or spin the lip and these glasses will sproll, but they won't spill! Playing bartender at home? Another awesome benefit of the Wobbly Whiskey Glass is that you can slide them across a table with surprising ease. It may seem counterintuitive, but the Wobbling Whiskey Glass is far more difficult to knock over than a traditional glass. 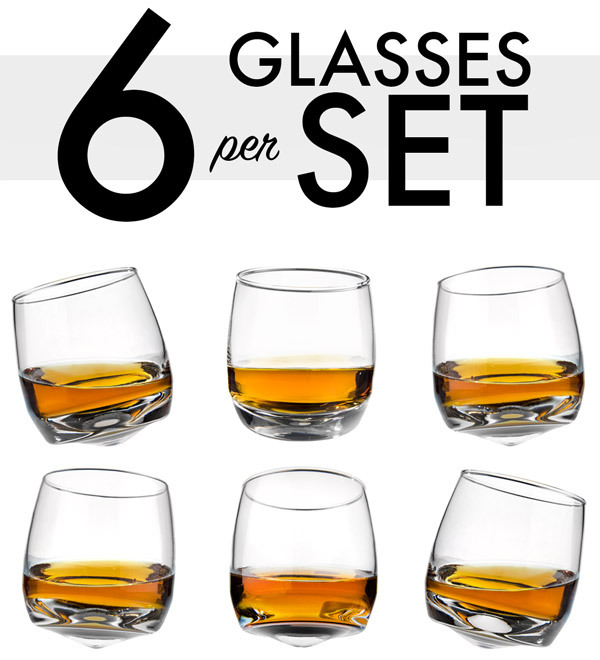 Each set includes six Wobbly Whiskey Glasses. It's the perfect gift for your favorite whiskey connoisseur. Wobbly Whiskey Glasses are sold in a set of six. Question: Can I drink other things besides whiskey from these glasses? *Ask a silly question and you shall receive a silly answer. Question: If I fill the glass all the way up to the rim and make it wobble, will it spill? Answer: Of course. But traditionally, one doesn't pour themselves over 6 ounces of liquor at a time! Two (heck, even three or four) fingers of whiskey will definitely stay inside the glass as the glass wobbles. Question: Hey, aren't these just like your Hula Wobbling Tumblers? Answer: We were attached to the now-discontinued Hula Wobbling Tumblers, and they'll always hold a special place in our heart. But, we just couldn't pass these up! Not only are they less expensive, but they come in a bigger set and are a slightly thicker grade of glass. Also, being clear, they'll match any decor.